Bring in Big Dog Stump and Tree next time you need tree services for your property. Our team of certified arborists are happy to help you with a wide range of services, from tree removal to stump removal. Call Big Dog Stump and Tree next time you need a reliable arborist! 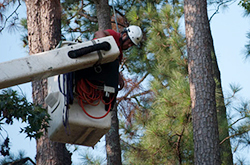 Our fully licensed and insured company assists homeowners and business owners in the Augusta, GA area with tree projects of all types. We have helped countless homeowners and business owners with their biggest tree issues after some of the biggest storms in the area, and we are happy to help you as well. Call today for professional and reliable tree services.